Snowflake Black-on-white seed jar from the Museum of Northern Arizona collections. Click the image to open the Cibola White Ware gallery. 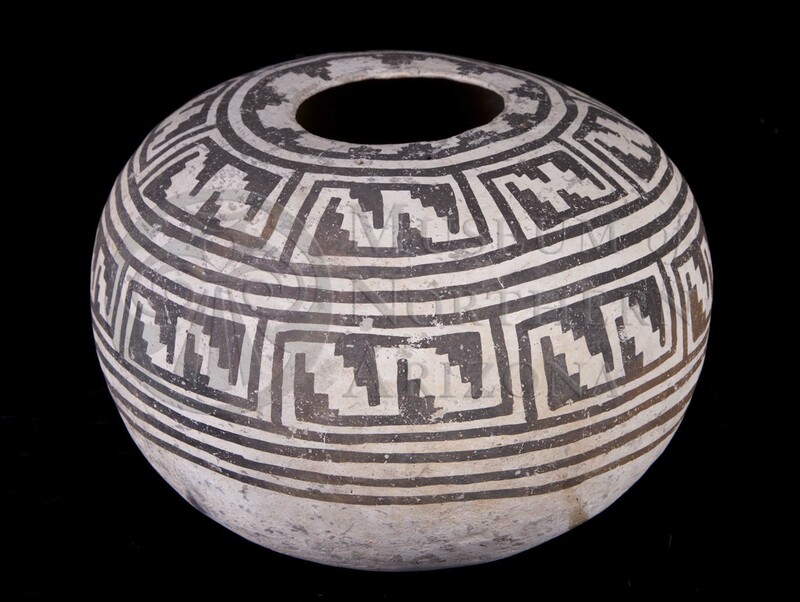 Cibola White Ware is a type of pottery that was produced in the northern San Juan Basin of New Mexico to the Upper Gila River drainages in the south, and from the white Mountains of Arizona to east to the Acoma-Laguna area of New Mexico. The seed jar pictured above is interactive! Types include: Chaco Black-on-white, Escavada Black-on-white, Gallup Black-on-white, Kiatuthlanna Black-on-white, La Plata Black-on-white, Pinedale Black-on-white, Puerco Black-on-white, Red Mesa Black-on-white, Reserve Black-on-white, Snowflake Black-on-white, Tularosa Black-on-white, and White Mound Black-on-white. Temper: La Plata, White Mound, and Kiatuthlanna Black-on-white: predominantly sand tempered. Other types tempered with sherds or a combination of sand and sherds. Forms: Jars, bowls, dippers, effigies. Decoration: Mineral paint, the defining characteristic of Cibola White Ware, with one exception: Chaco-McElmo Black-on-white has a carbon based paint with a Cibolan paste. Mills, Barbara J., Christine E. Goetz and Maria Nieves Zedeno. (1993) Across the Colorado Plateau: Anthropological Studies for the Transwestern Pipeline Expansion Project Volume XVI: Interpretation of Ceramic Artifacts. University of New Mexico, Albuquerque.